Toledo, OH, June 15, 2018 – Luber-finer®, a leading brand in heavy duty filtration since 1936, is pleased to announce that its website and online educational tool, Luber-finer University, are available in Spanish to better serve minority members of the heavy duty industry in the United States and around the world. 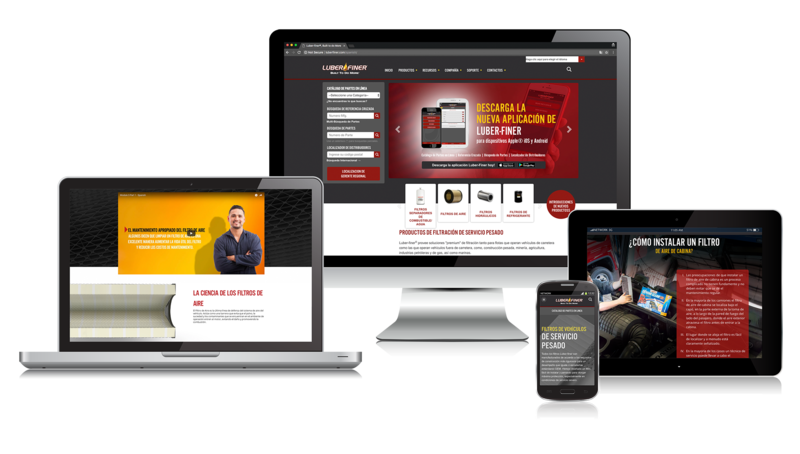 Hispanic drivers, technicians, fleet maintenance managers and parts distributors can now view Spanish versions of the Luber-finer website at luberfiner.com/spanish and Luber-finer University at luberfiner.com/spanish/university.php. According to the National Minority Trucking Association (NMTA), Hispanics own 44% of the 458,729 minority-owned transportation companies in America. Of the 3.5 million truck drivers in the U.S., 12.6% of them are Hispanic. The NMTA recently launched an initiative to create 500,000 transportation jobs for minorities by 2025. The Coalition of American-Latino Truckers (CALT) recommends that a company’s corporate website should at least include Spanish sections. Filtration Knowledge: Enroll in Luber-finer University, an engaging, interactive and free training program specifically developed to provide technical knowledge and insights about heavy duty filtration. For more information about Luber-finer heavy duty filtration products, please contact your Luber-finer sales representative, visit luberfiner.com or call (800) 851-3641. You can also follow Luber-finer on Facebook, Twitter and YouTube.